The Shields Library provides 24-hour access to study space year-round, including expanded locations to accommodate peak study times (e.g. finals). The 24-Hour Study Room is located at Shields Library and is open to currently registered students 24 hours a day, 365 days a year. The entrance to this space is located on the north side of building, directly across from the Quad. Students must swipe their student ID card at the card reader located at the entrance to access this space. Problems accessing the room should be reported to the Shields Library Circulation Desk. 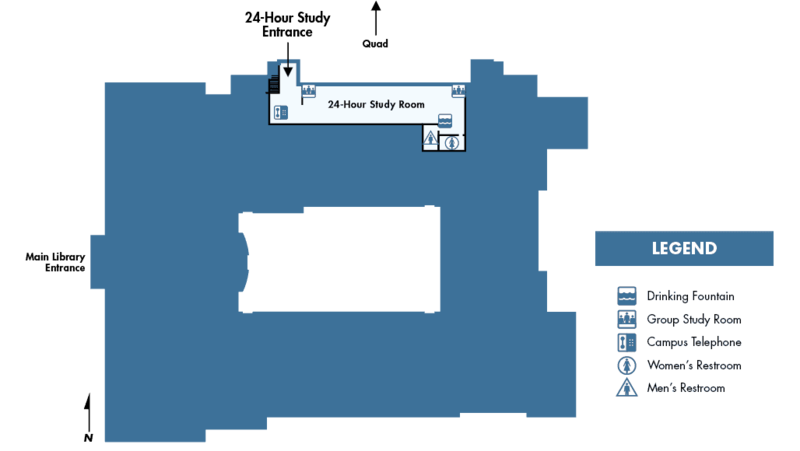 Wireless access to the UC Davis Network is available in the 24-Hour Study Room. A campus telephone is available near the entrance to this room. Shields After Dark -- More Space to Study! Shields After Dark allows 24-hour access to extra study spaces beyond the usual 24-Hour Study Room to support students preparing for finals. The Main Reading Room study area will be open 24 hours from March 17-20. After 2am, students can use their Aggie card to access both the 24-Hour Study Room on the first floor and the Main Reading Room on the second floor through the entrance facing the Quad.